Happy new year to you all followers of this blog. We shall all have better interactions this year and many years to come. As always, most of my articles benefits more of the newbies / novice among us that the geeks(when i say geeks, am talking about satellite installer and engineers). 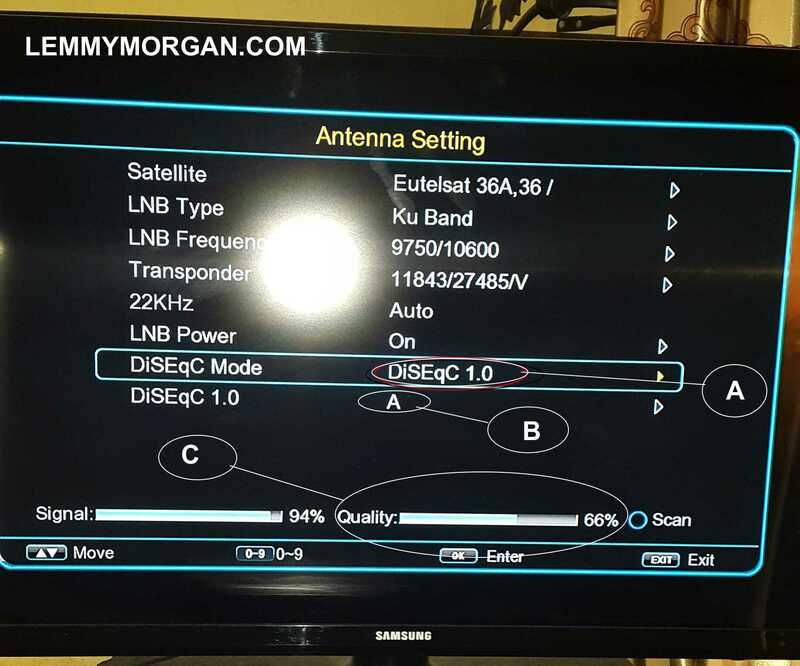 In this article, I will try and give hints on how you can get your decoder setup if you are using a disecq switch to combine two or more satellite packages on one single decoder without you having to call your local satellite installer. How does A Diseqc Switch Funtion? WHO IS QUALIFIED TO USE THIS DISEQC TUTORIAL? As a result of your upgrading your decoder, one Of the two satellite channels is displaying bad signal. 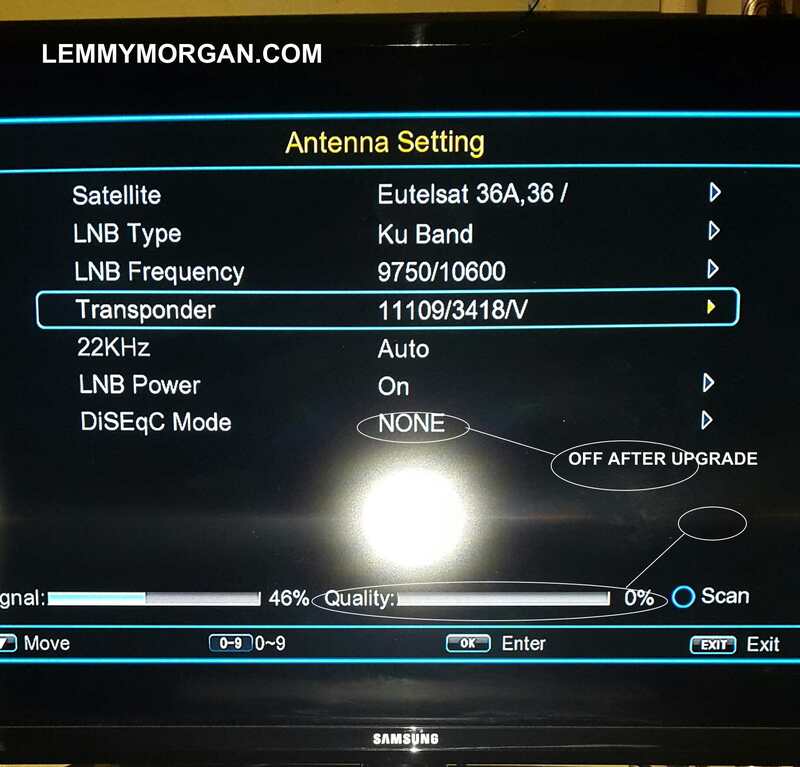 e.g, your dst* is showing fine while your daarsat / multitv / mytv is displaying bad signal. To start with, if you are using just only one dish, please don’t apply any setting from this tutorial.. That being said, for you to know that it is time for you to manipulate your diseqc settings on your decoder, the following events must have taken place. If the above is your case, there is nothing preventing you from setting this up yourself instead of you calling your local satellite installer. I will use qsat as my case study but this tutorial applies to all old, new, existing and uocoming decoders. All you must know is that you have to locate the name Diseqc within your decoder. The diseqc setting is always under Installation / Antenna setting of any decoder. how can I calculate dish size from a location where lyngsat tells me 0dbw on a particular satellite? I’ve gone through it but could not comprehend how in west Africa one can know dish size for nilesat or hotbird before trying it out since the satellites don’t cover the region. @Paul: If you already know that the satellite do not cover your region, it is time to look for one that is receivable in your region sir. 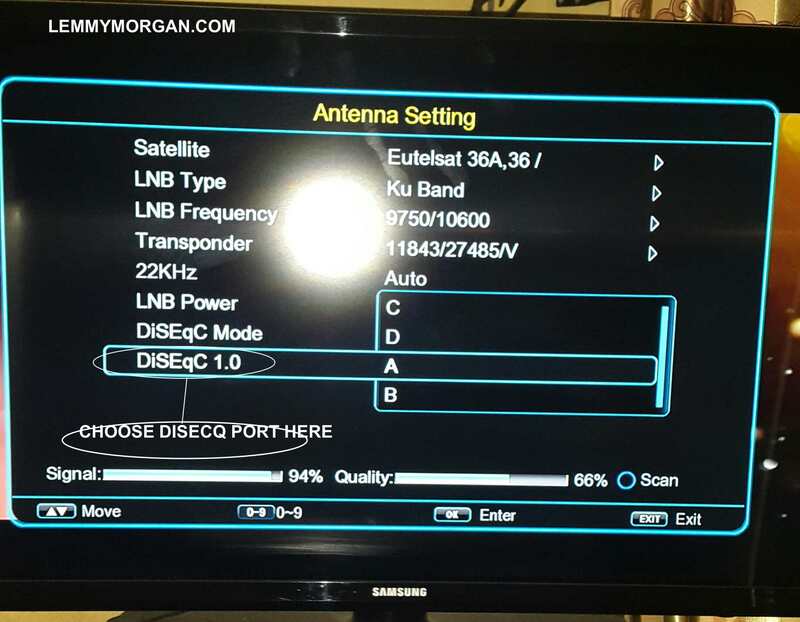 Mr Morgan, i’ve been tryin to get the Amos 17satellite with my 4663x decoder but i couldnt get it, pls help me, is there anything i’m missin or doin wrong? So Boss, I can I make the youtube work? Or are there cases where nothing can be done? Hi Lemmy, my srt 4922a did not stream youtube with with my 3G modem and the 163 patch. Can cccam work in the srt 4922a using a 3G modem? @raymond, you must get youtube working before thinking of buying a cccam account. which other satellite can I get in Ghana with my Qsat ? I have two dishes FTA chanells I mean. @bemu,thanks dat is wat i want to here from mr morgan. I blind scan on Amos 17.0e and it didn’t find Kennis and other. I lost all the channel on 11008V3002 , a lots channel. What’s wrong and what to do? Please help me. @Felix and Lemmy you do need a diseq when combining Ku and C band. @oluwole, they are not on the same position thanks. wat about us dat use motorize dish. thanks much lemmy, ur mails are a blessing. However help me out with this. after setting up my diseqc, channels on one dish do not appear. if the multitv channels appear, the channels on the other dish do not and vise versa. what am i not doing right? i need help, sir. Hi Lemmy pls I downloaded Azsky recharge tool V3.06.rar and flashtool with my bb,if I copy it to my desktop or laptop, will it work for recharge? Thanks Lemmy for this. It helps me make working some channel that was showing bad signal. However remains some issues. On the same satellite some work on port B whereas some on port D in my case. Some shows service not available on another satellite whereas some bad signal on other satellite whatever the port. You know on Eutelsat36A36 Kennis music, mm24 quest and other on 11006V29995 Shows service not available even though the signal are good. And on Ku_Amos5 c the same channel on 11008V30002 shows bal signal whatever the port. So am wondering what to do to see those channel. Any bit of help are welcome. happy new year lemmy and to all the house, pls, i have a problem with my amos 17e(daarsat), since 2weeks ago most of the channels on Amos are working exception of this, (Ait, Ait sport, Ait palamentary,Ait News,Nta intl, Berekete tv) it showing bad signal, so what can i do to resolve these? Thanks in advance! Happy new year sir. I deeply appreciate you making me to have fun in 2014. Sir, my Q13G decoder avatar code expired immediately the shout of happy new year. It now says “active number expired or box hasn’t account”. What do I do to watch qsat again? Kindly assist sir. Many many Happy returns Oga Lemmy, Aside AzSky dongle which product will you recommend as a back-up should in case something happens which is inevitable. @lemmy. Please in wat situation am i expected to select 1.0/1.1 under diseqc mode. good morning Lammy and thank u very much for ur tutorals, God bless u.
please am tracking Amos 17° E but my friend said I can get infinity tv when my quality signal increase to 75%, but I have.tried yet I only get 60%. please is the any techique to.use to increase to that 75% or more. thank u sir and good morning ..
for diseqc setting,my instructor thought me well on it so I don’t have problem with itd settings..
God bless u sir .